Indonesia is an attractive destination for marketers around the globe. 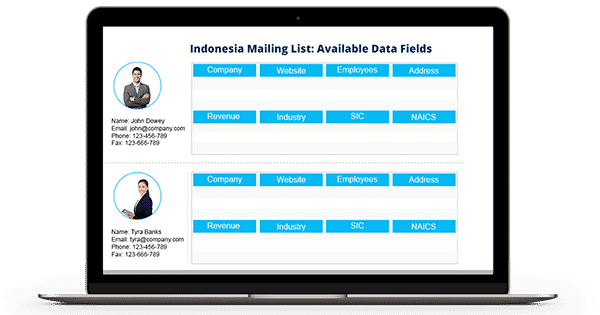 If you too wish to tap into this highly rewarding market, Blue Mail Media’s Indonesian Business Executives Mailing List can give you access to complete marketing information to connect with your prospects and customers via email, mail or telephone. We are highly committed to provide you with the most result-oriented database that would help you garner the best fruits of multi-channel marketing. Our Indonesian Business Executives Database can unlock seamless connections between you and your target audience and help you explore new avenues of revenue. Our Indonesia Business Executives Email Database has been aggregated from innumerable reliable sources. Blue Mail Media’s skilled team of data scientists, analysts and professionals make significant efforts to collect and verify data and update the same on a timely basis to maintain the accuracy of the database. With Blue Mail Media’s List of Indonesian Business Executives, you can surely achieve more on your marketing efforts, with improved response rates, conversions, and ROI. Blue Mail Media’s data partner network across USA, UK, Canada, Europe, Asia, North America, Australia and other countries enables us to serve clients without any geographical barrier. Also, we understand that each business has unique aspirations from their marketing campaigns, and thus, we offer pre-packaged as well as customized Indonesia Business Database based on your campaign specific demands.